Can't see the audio buttons? the persistent application of new methods." The Baron Son titled "The Irresistible Force." "The Irresistible Force" illustrates how to find your calling in life and create your definite purpose. Many of the most successful people throughout history, from Andrew Carnegie and John D. Rockefeller to the modern day Barons, credit definite purpose as the most important factor for achieving success. Empower yourself and your friends with this free gift! To download, right mouse click this link, and choose "Save Target As...."
BaronSeries.com is a finalist for the Black Web Awards - Best Lecture Speaker or Workshop Site. Please take 2 minutes to cast your ballot. Click the Black Web Awards image below. Go to the Best Lecture Speaker or Workshop Site drop down menu. Everyday our mailboxes are flooded with advertisements, catalogues, and "pre-approved" credit card offers, hoping to deplete our savings and draw us deeper into debt. In the latest Survey of Consumer Finances, conducted by the Federal Reserve, concern has been expressed that the rising level of debt may become "excessively burdensome to families." Similarly, the American Bankruptcy Institute reports personal bankruptcies are at an all-time high, and in 2005, more than 2 million were declared. Despite crippling obstacles and massive debt, thousands of young adults are now beginning a new path to financial independence with the help of Wealth Coaches William R. Patterson, Vicky Therese Davis, and D. Marques Patton. Building on the strength of their sold-out workshop series and National Bestselling book, The Baron Son: Vade Mecum 7, Davis, Patterson, and Patton are reaching out to empower the next generation of entrepreneurs and investors. 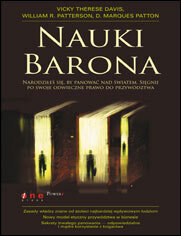 The Baron Son audio book (ISBN 1596590734) will be realeased on November 20, 2006.